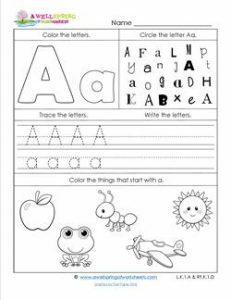 Here’s one of our abc worksheets, this one just for the letter a. Your kids have opportunities to trace the uppercase and lowercase letters and write at least three more of each, color the bubble A and a as well as the pictures of the things that start with a. Take a look at the box on the top right. Here’s where things may get a little tricky. Kids are to identify the letter a in different fonts. I’m sure they’ll be able to find all 8 of them, an uppercase and lowercase in each row.